Kevin: At some point in the future, Clarence, we'll have to hold a larger discussion on the topic of horror as a whole? I'm a fan of the genre, but horror is often hamstrung by its own financial success. Studios know that there's a sizable chunk of young moviegoers (and let's be honest, they're the ones who drive box-office receipts) who will plunk down their dollars for any film inhabiting this world, and so we're often treated to lots of schlock as a result. 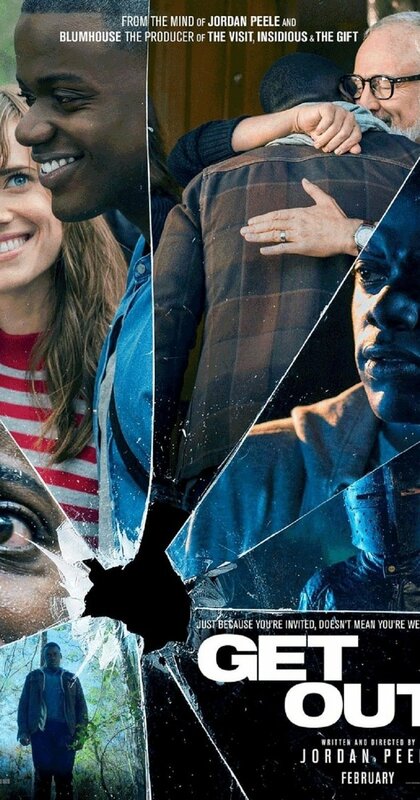 Chris (Daniel Kaluuya) and Rose (Allison Williams) are an interracial couple who, after five months of dating, take a road trip to meet her parents and spend a weekend in the country. One small wrench in the works? Rose hasn't told her (White) parents that Chris is black -- but she insists that everything will be fine. "My dad would've voted for Obama a third time if he could," she adds, in an attempt to assuage his fears. He's apprehensive, but acquiesces. When the pair arrive at her parents' palatial estate, Chris' spider-sense immediately perks up. The family's black servants regard him rather strangely -- albeit with constant smiles -- and rather than being denigrating, Rose's parents and brother seem to go out of their way to inelegantly praise Chris' genetic background, particularly as regards athletic pursuits. And did Rose forget to mention that there was going to be a big family gathering that weekend? Suffice to say, things get very dangerous for poor Chris in a hurry, and it's all brilliantly foreshadowed in a manner which calls for a repeat viewing. There's a rhyme and reason to each of the guests' non sequiturs and odd affectations -- behavior that would've probably raised red flags with Chris much earlier, if he hadn't already been primed to feel awkward and out of place. Before I get to my critiques and thoughts on the conclusion, Clarence, what did you think of the parallels that some critics made between Get Out and the Sidney Poitier classic, Guess Who's Coming To Dinner? Also, we mentioned the documentary OJ: Made in America last week -- another tale which discussed the tension involved with a black man trying to make a home in white America. Do you recall ever seeing the subject of race addressed within the horror genre before? Clarence: Before I answer, I just want to take a second to praise Writer/Director/Producer Jordan Peele for such a well-made and entertaining film. Pretty much all of the filmed sketches from his Comedy Central show with Keegan-Michael Key have a cinematic quality to them, so maybe it's not such a surprise. I'm looking forward to seeing whatever he does next. As far as the subject of race in horror movies goes, I do remember vividly the ending to Night of the Living Dead where the capable and heroic black guy in the group meets a racailly-charged fate that wasn't lost on culture commentators in the '60s. Nothing else immediately comes to mind as far as mainstream movies go, though. I suspect the thing about Get Out that gets under viewer's skins is how closely the movie's narrative mirrors the real-life experiences of many of the people watching it. Nobody has direct experience confronting zombies or mutant chainsaw-wielding maniacs, but a significant segment of this movie's audience does know what it's like to be followed by strangers while walking somewhere they're not "supposed" to be, to be watched and evaluated and judged by people who may or may not have their best interests at heart, or to have other people simply act differently because a Black person is in the room. Get Out uses these common experiences not just to make statements about racism but also propel the story. In that sense, the key to why Get Out works so well is that it's not a horror film, at least not just a horror film. To me, Get Out is just as much a conspiracy movie, a genre that delivers its horror in a different way than your standard gore-fest monster picture. A similar film that came to mind when I was in the theater was The Wicker Man (The 1973 original, not the crappy 2006 remake), another movie where the main tension comes from the protagonist first having to figure out what the hell is going on, or even IF anything is really going on, which is a great source of angst in movies and in real life. While Sidney Poitier and O.J. Simpson are important figures in the Conversation About Race, I feel there's a more immediate audience connection with a young man/ regular guy who's just trying to meet his girlfriend's parents. And I felt Get Out's more traditional horror movie elements bring it in closer in line to those great Blaxploitation era flicks like Scream Blacula Scream (where race is the theme but not the topic, so to speak) than works like Guess Who's Coming to Dinner and the fantastic O.J. documentary. I'm very curious to know what you thought of the ending. Also, I no ticed the wonderful lead actor, Daniel Kaluuya, is yet another Englishman who took a role playing an American and completely nailed it. Why is it British actors excel at doing that? Agreed on the original Wicker Man. Another film in that same vein was The Stepford Wives (also later subjected to a shoddy remake), where everyone seems to be clued in on the deceit save the bewildered protagonist. And that tale was filled with all sorts of wry commentary regarding gender relations and the women's liberation movement, much like the way that race is brought up in Get Out. 1) The insertion of Rod Williams (Lil Rel Howery) as comic relief. The idea of giving Chris a friend back home to piece together the case and try and muster up a cavalry? Totally valid plot device. But the fact that his character was largely played for laughs pinballed me out of the story and diffused the tension. I prefer my horror unadulterated, and it lended a bit of a madcap vibe that I thought was misplaced. Maybe this was a nod to Peele's comedic background? 2) You've probably read about Peele's original idea for the ending of the film, with the cops actually arresting a battered Chris after rolling up on him while his hands were locked around Rose's throat? Now that would have been a powerful finish which would've really tapped into the zeitgeist in a frightening way. After all the horrors that Chris endures... it's the police who ultimately bring him down. Cut to black. Wham. It'd be a Darren Aronofsky-esque gut punch. Peele says that he changed the conclusion because of the recenthigh-profile law-enforcement brutality cases, and that he felt we needed a "positive feeling when we leave," but I think he almost shortchanges the audience this way? We've seen the standard finish (Chris' friend Rod driving in to save the day) a zillion times, and I think it helps numb us to some of the difficult subjects raised in the film. I'd rather keep dwelling on them as I leave the theater. I do think there is more than a bit of the sketch comedian in Peele's technique. He and Key did a movie last year called *Keanu* that was pretty good but felt very much like a string of comedy sketches held together by a wafer thin plot. Get Out is a definite improvement over that film in those terms. I'm wondering if, as his career progresses, Peele will move further away from that kind of sensibility. What might help that along is for him to direct a movie he didn't write, or write a movie someone else directs. I did read about how and why the ending of Get Out was changed. I think you're right, the way it was "supposed" to go feels to me like it would have been a much more poignant and pointed conclusion. Part of me wants to think that Peele was pressured by his studio to change things up, but then again I don't think anyone thought the movie would become this popular. Peele's rationale for changing the ending due to society being more "woke" about the continuing presence of racism makes sense, although as we've seen, other recent films continue the conversation in very direct ways. While I've never met him, watching him work and reading about him I get the feeling Peele is a pretty optimistic and positive person. Most filmmakers probably feel the urge to throw in a ray of sunshine or hope in even the bleakest story, if only for their own sanity. Considering the overwhelming nature of the 24-hour news cycle, the desire to lock on to something good in the world, even if it's a plot point in a story, might be another sign of the times. Did you see the movie? Want to add to the conversation? Leave a comment below! Make sure to use the <SPOILER> tags if discussing key plot points. Share March 17, 2017 • http://chrp.at/1q1r • Share on Facebook • Tweet This!